We are right in the middle of summer and we hope it’s been a good one for you so far! Kids are home from school, vacations are upon us, and families are spending more time together as a result of a more laid back schedule and a change in pace. Don’t miss the opportunity to invest in your marriage by planning some fun and creative date nights with your spouse. We’ve compiled a list of local attractions and other date ideas for you and your spouse! 1. Pick peaches together at Jaemor Farms. Jammer’s annual Peach Festival is Saturday, August 4th, 2018 from 9AM - 4PM. Visit HERE for more directions, pricing, and more information. Jaemor Farms also has a Fresh Produce Market where you will want to check out their must-buy homemade fresh breads, jams & jellies, pickles, relishes, BBQ sauces, marinades, dressings, pies, ice creams, cakes, boiled peanuts and much more. 2. Rent Jet Skies for the day. 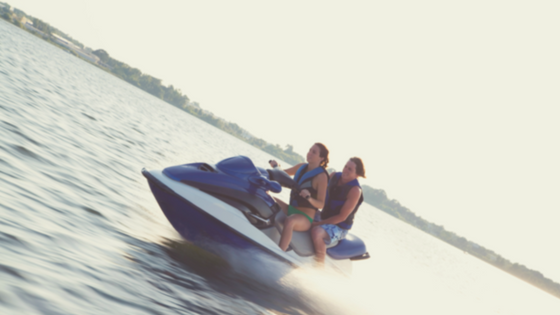 Spend the day enjoying and exploring the beautiful Lake Lanier together. Drive up to Skogie’s Lakefront Restaurant for some delicious local food. Boaters can park at Gainesville Marina's courtesy slips. Visit HERE for pricing and hours of operation. 4. Visit Don Carter State Park for an afternoon of hiking and swimming! Or plan a weekend to go camping together! Things to do include: hiking, swimming, biking, fishing, paddle boarding, picnicking, kayaking, and much more! Visit HERE for more information. 5. Take The Solar System Walking Tour. The Solar System Walking Tour is a scale model of the solar system. This is a great way to learn about placement of the planets in relationship to the sun and moon in a very practical way. The tour, once completed, is a total distance of 1.8 miles and includes the following locations: The Downtown Square, Rock Creek Park, Rock Creek Greenway, Ivey Terrace Park, Wilshire Trails Park, Longwood Park. Visit HERE to schedule your tour! 6. Plan a day to visit Gibbs Gardens in Ball Ground, GA. Enjoy strolling together through the beautiful gardens while having uninterrupted conversation and fellowship! Visit HERE for pricing and directions. 7. Go to a drive in movie in Blueridge, GA. Pack your favorite snacks and make some comfy seating in the back of your car to enjoy a summer night at the movies! Visit HERE for directions and movie showings. 8. Go see a Brave’s Game. A summer isn’t complete without a trip to see our very own Atlanta Braves! This is a fun double date opportunity! Invite another couple and have fun cheering on the home team! 9. Go pick local blueberries together at Cool Springs Blueberry Farm. Spend some time together outdoors picking some local blueberries to stock your freezer full! And of course when you get home, don’t forget to try your hand at some homemade blueberry cobbler. Visit HERE for hours and directions. 10. Have a picnic at a local park. Gainesville has a wonderful selection of parks for you and your spouse to enjoy a picnic, go swinging, walk some trails and more! For a list of local parks visit HERE. 11. Play a game of mini golf. Enjoy a cool summer evening playing a game of mini golf! This is also another fun double date opportunity. Visit HERE for directions and pricing. 12. Visit the Gainesville Farmers’ Market. Each Friday from 2:30-6:30 through October 6th, the Gainesville Farmers Market will have local fresh-picked produce, honey, farm-fresh eggs, pasture-raised pork and beef, baked goods, cut flowers, hand-made crafts, food, boiled peanuts, cooking demonstrations, and live music. Visit HERE for more information! July 6: 4th Annual Beach Bash. 100 tons of Sand and Fun, limbo contests, hula hoop contests, a beach, live music and more! From 7pm-11pm on the Downtown Gainesville Square. August 3: First Friday with the Fly Betty Band! There will be dancing in your seats and on the streets from 7pm-9pm in Gainesville's Roosevelt Square. 14. Take a cooking class together. It’s always fun to learn to cook a new dish and even more so when you get to do it with you spouse! Cooking classes are offered at Sur La Table at North Point Mall in Alpharetta, GA. For more info visit HERE. 15. Try a new local Restaurant. We all have our favorite places to eat, but sometimes we can get stuck in a rut going to the same places over and over. Gainesville has some GREAT local restaurants, so spend an evening together and try a new one! Check out a list of some of Gainesville’s best restaurants HERE. 16. Visit the Atlanta Botanical Gardens in Gainesville. No need to drive to Atlanta to visit the Atlanta Botanical Gardens, we’ve got them right here in Gainesville! Plan an afternoon to go strolling through the gardens together. For other fun classes and activities, visit their sight HERE. 17. Go to a “Food Truck Friday” at Lake Lanier Olympic Park. On July 20th, there will be a variety of food trucks, entertainment, and other fun at Lake Lanier Olympic Park. Admission is Free but you can pre-register HERE for a chance to win some cool givaways!